please update your wordpress installation. it's not secure. Whoever that is, thanks for reminding. Wanted to do it long time ago, but too busy. Although you sounded like a hacker who would hack my blog if I don't upgrade, but anyway, thanks again. Upgraded to version 3.0 now, but didn't notice much changes in the user interface from back-end. Shall spend some time to explore soon. I've just upgraded this blog to version 2.8.1. Planning to do so since months ago. Finally I was forced to do so because I was not able to upload any media to this blog. Not sure whether this blog got hacked again or it's a problem with the old version. I was expecting to see more in the admin page but I only see layout changes. I remember the surprise when I last upgraded. Anyway, WordPress is already doing a very good job. I really appreciate it. If you see any disorders when you are at my blog (or RSS readers), do drop me a comment. Three weeks of hard work and I finally cleared my inbox, from 3,000 messages to 0 message. Maybe I'm not as effective as the problogger who took only a day to do it, still, I managed to clear it! Some of the mails in my mailbox dated year 2005. That was the last time I cleared everything. It even run out of storage at some time, luckily Google increased it. All I did was to label each of the email with related Gmail labels (I have 20+ of them), then archive it. If you are interested to do the same, Lifehacker has a good guide on this. Other than my mailbox, I also just remove all icons and files from my desktop. I love empty desktop. Especially when I need to show it on a projector when I am doing a system demonstration. I also had a paper tray that keeps all documents pending to be filed. Two hours of filing work yesterday, it is also empty now! I feel good now. Hopefully I could keep them always empty after this. That day, I mentioned about Chitika gets hacked. And yesterday, my blog got hacked. My colleague notified me about it when he saw these in his Google Reader. Actually, these are few of the drafts that I planned to write, but due to demanding works, I ignored them for months. They somehow managed to add some links to the end of the drafts, then publish it. The hacker also managed to changed the upload path to somewhere else, and it actually took a while for me to figure out. I only wonder why my images are being uploaded to a weird directory. 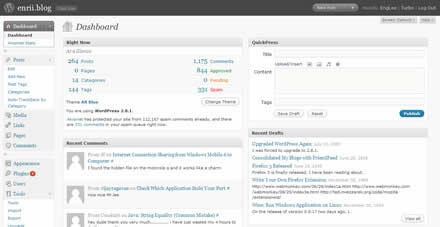 Finally, all seems to be OK now, after I upgraded to WordPress 2.5. Update: I notice some compatibility issues for my theme after I upgraded to version 2.5. Fixed a few of them. Please let me know via comment, if you found any problem with my blog. I was very surprised when I know that they are not spams! Somebody actually has some spare time to review my blog and sent all those pingbacks from one single post. After reading the review, I can't really conclude whether it's a positive or negative review (Or simply just trying to make fun of my blog). Anyway, thanks to Nice4Rice for spending time to research on me and my little blog. At least, I know there are people out there who read my blog. ...maybe I need an "about" page for them who are interested about my personal stuffs.